This sausage is made especially for our store. This WORLD CHAMPION sausage is a must try. Contains no MSG---Great flavor. 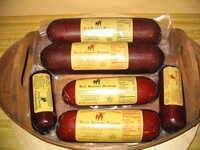 Truly our most popular summer sausage. This sausage is available in PLAIN or GARLIC. Service Area: Madison, Middleton, Janesville, Portage, Stoughton, Oconomowoc, Wisconsin Dells, Green Bay, Racine, Hartland, De Forest and surrounding WI communities.